Tag line: "Murder's Just a Phone Call Away"
Don't Answer The Phone is exploitation in every sense of the word, right down to its title (originally called The Hollywood Strangler, it was changed to cash in on the success of other “Don't” films released around the same time). It's sleazy, cheap, and, on occasion, downright tough to watch; in short, everything you'd expect an exploitation film to be. There's a serial killer loose on the streets of L.A., one who's been strangling beautiful women in their homes. The killer, a Vietnam vet named Kirk Smith (Nicholas Worth), poses as a photographer to gain easy access to his victims, then brutally rapes and murders them. A deeply disturbed individual, Smith occasionally calls radio talk-show host Lindsey Gale (Flo Gerrish), posing as a Latino named “Carlos” and describing his dark obsessions in great detail. When a caller to her show is murdered by Smith while on the air, Gale alerts the police, who thus far have been baffled by the randomness of the killings. With Gale's help, Lt. Chris McCabe (James Westmoreland) and his partner, Sgt. Hatcher (Ben Frank) move closer to identifying the killer, but will they catch him in time to prevent his next murder? 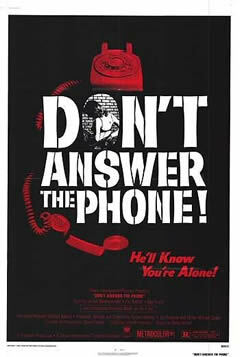 Don't Answer the Phone hits the ground running, providing a quick glimpse of the killer's demented personality (the opening shot is of a shirtless Smith standing in front of a crucifix, grunting and smiling with his arms outstretched) before leading us directly to the first on-screen murder. Having followed a young nurse (Dale Kalberg) home, Smith sneaks into her house, watching as she slowly undresses. The phone rings, and Smith listens in as the girl talks to her “mother” (I put mother in quotes because there's no way the voice on the other end of that phone is a woman's). As soon as the call ends, he strikes, strangling her to death before ripping her top off. The scene concludes with Smith standing over the girl's naked, lifeless body, crying as he admires his handiwork. It's not a particularly bloody kill, but that doesn't make it any less disturbing. In fact, the troubling nature of the murders is one of the few things Don't Answer The Phone has going for it. On the whole, the film's a bit of a mess: the set pieces are lame (at the studio where Lindsey Gale hosts her radio program, the wall of the control booth is completely bare except for a lone Close Encounters of the Third Kind movie poster hanging in the background. Try figuring that one out), the cops are complete morons (despite a number of obvious clues recovered from each and every crime scene, they have no idea who the killer is, where he might be, or even what he does for a living), and the dialogue is, at times, downright ludicrous (At the scene of the first crime, Hatcher asks the guy from the lab, played by co-writer Michael D. Castle, if he took a picture of the victim's breast. “Which One”, he asks in response, “She has two of them, you know?”). As for the performances, only Nicholas Worth seems to be giving his all; everyone else looks as if they're sleepwalking. Now, I've never hidden my love for eccentric exploitation films, and Don't Answer The Phone certainly fits that bill, and for what it is, I enjoyed it. That said, I'll also be the first to admit it's not a movie for everyone. As a horror film, Don't Answer The Phone falls flat more often than not (yes, the kills are disturbing, but there's no real tension generated leading up to them, and the complete lack of bloodshed will undoubtedly turn off a good many fans of the genre), and because we know the killer's identity right at the outset, the film doesn't even work as a mystery. If you harbor fond memories of the grindhouse era, then Don't Answer The Phone will be right up your alley. All others may want to think twice. If it's Grindhouse style according to your last statement then this is worth a viewing. Thanks Sir Doctor from giving us fans more horror reviews. Yes, this is definitely a low-budget exploitation film. If you like those movies (and I definitely do), then DON'T ANSWER THE PHONE won't disappoint. As for the extra horror reviews, it's entirely my pleasure. also has some great scenery of Hollywood in 1980, the guy that plays the killer is flat-out hilarious in his portrayal, definitely worth a watch, the whole things on You Tube.